Who ever thought slime could be this soft? This fluffy slime creation will make your hands feel like they’re wafting through cloud nine. It’s the perfect consistency, that is to say both slimy and fluffy. You won’t be able to stop touching this once you feel the soft, smoothness of the putty. This DIY starts as a sticky texture, but the more you massage the slime, the softer and fluffier it gets. 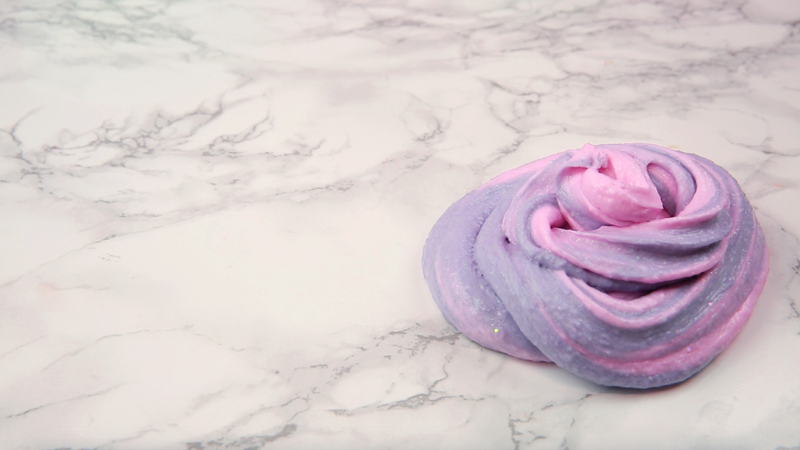 Colorful glue and food coloring are the key ingredients to get the pretty pastel pink and purple swirl, while the shaving cream creates the fluffiness. With a few more ingredients, you’ll be ready to go. Watch below, and you’ll see why this slime is perFLUFFtion. 1. Pour glitter glue into a large mixing bowl. 2. Add baking soda and shaving cream. Stir until fully combined. 3. Separate into smaller bowls depending on how many different colors you would like to make, and mix in food coloring. 4. Begin adding contact solution, slowly, to activate the slime. Stir quickly, so the contact solution spreads evenly throughout the mixture. Begin kneading with your hands and continue to add contact solution until the slime is no longer too sticky to handle. Be sure the contact solution is fully mixed in, before adding more — don’t add too much or the slime will not be stretchy!